First of all I want to clarify that I highly recommend Pinker’s book. When I read reviews back in 2011, when the book was released, it felt as if this was another of the “optimistic” books that floods the market where authors confuse their unwillingness to accept serious threats with optimism. Therefore I ignored the book for five years, until I picked it up to check out one of Pinker’s arguments after a discussion. Reading the book I was surprised how interesting and well researched it was. Pinker is not a person who confuses ignoring scientific facts, with being optimistic. He does cherry pick data occasionally, but it is done in a systematic and transparent way (i.e. scientific way) so that is not a problem. I would actually argue that a broad approach to changes in society, along the lines that Pinker is presenting, is impossible to conduct without a cherry picking process (or to be more scientific, iterative process based on intuition). Many authors try to pretend that their assumptions are objective, but Pinker is transparent and tells us that the structure he presents is the result of a process that he think is worth presenting. Pinker is nowhere close to the simplistic media pundits dominating media when it comes to statistics. Pinker’s approach and findings are much more interesting. The transparent cherry-picking result in significant oversimplifications in a number of areas, but even those simplifications are inspiring as it is easy to see what happens is you change the key parameters Pinkers use. Pinker’s book provides a lot of material for a conversation about global priorities and it also provides countless nuggets of fun information. He use proper footnotes and usually have decent sources for the facts included. This is something that I think should be standard, but it feels as if people are becoming more and more sloppy with sources and footnotes. When it comes to the basic structure of the book it structured around six trends. Pinker presents them in the following way: “To give some coherence to the many developments that make up our species’ retreat from violence, I group them into six major trends.”. These six trends are illustrated in the graph below. The first trend, the Pacification Process, is mainly outside the graph as it “took place on the scale of millennia, was the transition from the anarchy of the hunting, gathering, and horticultural societies in which our species spent most of its evolutionary history to the first agricultural civilizations with cities and governments, beginning around five thousand years ago. ”. This trend started 3000 BC and ended around 1000 AD. This is the only trend that does not overlap with any other trend and is also the trend where data is most difficult to get. The other five trends are overlapping and as in most simplified overviews the trends gets shorter and shorter as they get closer to todays date. Of the six trends, four are still ongoing and often difficult to separate. The second last trend, the rights revolution, is different. All others focus on reduction of traditional violence (basically armed groups fighting in different shapes and forms), but the rights revolution focuses on the more cultural/institutionalized violence against “ethnic minorities, women, children, homosexuals, and animals.”. The last is also the one where Pinker has to admit that the trends are pointing in the wrong direction regardless on how you play with data when it comes to our relation to other animals. It is when he comes to the concrete forces that things become interesting, but it also then where the weakness of the book becomes evident. The forces are poorly defined, and how they have impacted society is not very clear. 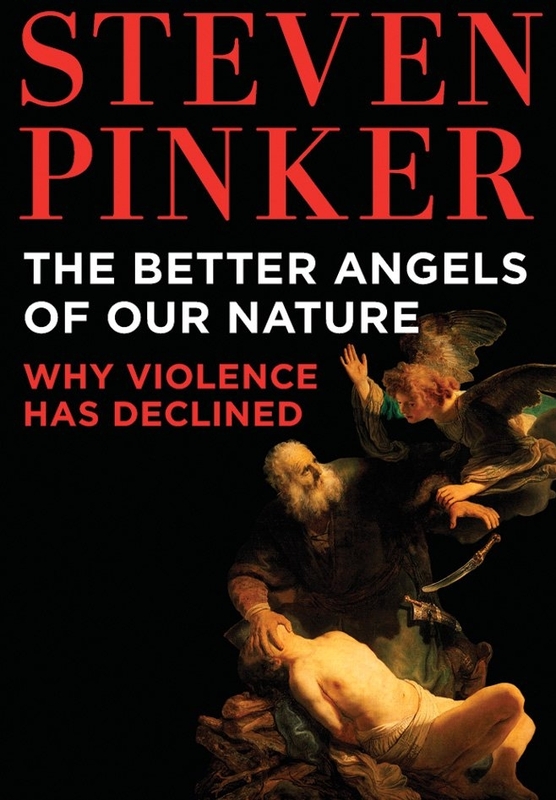 Pinker argues that from many perspectives we have seen an overall trend where organized violence between humans has been reduced over time. I would argue that as an overall assessment it is easy to argue that this is true, but that such an assessment is not always very helpful. Where such an assessment could be interesting is if measures that people want to implement to reduce current violence (or other problems) could be shown to have been part of a situation where we had much more violence earlier. ➢	The idea of the noble savage is a myth ➢	The period of industrialization has been very positive when it comes to reduced human-human violence ➢	The last decades have continued to deliver reduced direct physical violence against humans in most societies around the world ➢	There is nothing inherently peaceful in humans, we create different frameworks that can strengthen and weaken different parts of us. So far we have been successful in reducing many of the violent aspects. ➢	The violence against other species and nature has continued to increase. While general acceptance for such violence has decreased, the industry so far have mainly responded by hiding the problems. Some improvements have been made, but the rapid increase in volume has more that offset those improvements.